Autor: Andrei Nicolaide, Wilhelm Kappel, Elena Helerea s.a. The central element of any electric drive or of many applications of electricity arrived nowadays, after many years of history, at a level close to the maximum of technical performances that theoretically can be reached. In the design and calculation of an electrical machine, from the books of Richter, which represent a guide of a designer of electrical machines, till nowadays, new design and calculation methods have been developed, based on computer programs for advanced computation methods, like the finite element method and simulating methods leading to the optimization of the construction of electrical machines, and the selection of materials and adopted technologies allowed to reach a high efficiency, which according to recommendations of the IEC, tends to approach unity. If from the construction point of view it seems having arrived at a theoretical limit, in the fight for the increase of the efficiency of the motor or of the application, in which the motor is a component, the hope goes towards the technology for the achievement of the motor, to the selection of best applications in which, through the imposed regime of operation one assures a high efficiency of the system, and an optimal choice of the magnetic materials (rare earth) and of the insulation. The fulfilling of these requirements implies the organization of the technological process, ensuring also the competitivity of the producer on the market. Answering these requirements, the present work offers to the reader a procedure for the calculation of a synchronous machine of range of kilowatts, validated by experimental tests, assuring a high efficiency and dynamical performances specific for certain applications like wind or hydro turbines, due to the usage of new constructive solutions and utilization of adequate materials, as well as the application of new calculation procedures belonging to the team. In order to help the producer, and except performance, assure also economicity, the authors suggest a new solution for the construction of the synchronous machine, applicable when the producers has also in fabrication, series of asynchronous (induction) motors. Then, being the same, one can use the housing, stator, shields and other pieces from the induction motors for the synchronous machines. The solution given by the authors is interesting and can lead to important economic effects due to the versability which allows the producer to use efficiently the technological lines without main modifications. Applying a calculation procedure, specific for usual synchronous machines, but with an original adaptation concerning the calculation of the inductor field with permanent magnets, a constructive solution of the inductor rotor with permanent magnets, with skewed permanent magnets of parallelepipedic form, protected by polar pieces is presented. The solution avoids the cogging torque between poles and stator teeth. The fact that the work satisfies the proposed aims, is due to the co-working of the three partners: two units with a recognized experience in the calculation o electrical machines and their testing, namely a university (Transilvania University of Brasov) a known profile research unit (National Institute for Research and Development in Electrical Engineering, INCDIE ICPE-CA of Bucharest) and a tradition producer of electrical machines (S.C. Electroprecizia S.A. of Sacele, Brasov), all units recognized for their contributions made for the development of electrical machines. I cannot finish this foreword without referring also to the contribution that made the team which achieved this work, an interesting work by its originality of the given solutions, by the conception which involved the efforts of the authors by applying new calculation methods, modelling and simulating of operation regimes, selection of materials, new fabrication technologies and testing methods. The presented work is an example of ”good practice” based on original technical considerations which lead to the development of certain interesting solutions, fitted to be generalized for other types and dimensions, like a guide for the designers as well as for students, in order to see how to be approached the design of an electrical machine. Namely how to elements with theoretical specific and high precision computation procedures, can be added, together with innovative constructive solutions and adequate technologies. Florin Teodor Tanasescu, Prof., Dr.Eng. The last years, outstanding achievements took place in several domains like: microhydropower plants driven by wind or hydraulic turbines; traction systems; advanced power and command electronic sub-assemblies; semiconductor active circuit elements; magnetic materials with high magnetic remanence. This progress has lead to the achievement of synchronous machines in broad and small power ranges, among which electrical machines with permanent magnets. The present work is devoted to the development of synchronous machines with stator stack made of punched sheets and three-phase stator winding, and interior rotor with high coercivity permanent magnets, usually of rare earth, representing the inductor. The adopted construction of the rotor has been detailed in the work, and during several years has proved a good behaviour, even in comparison with solutions used by various producers. For the electromagnetic and other calculations, approximation and numerical methods have been successively used for permitting simple as well as high precision results. 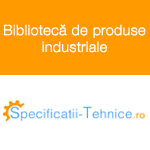 The achievement of the work finished by the construction and proof of the electrical machine, devoted to generator operation, has been carried out in the framework of a consortium composed of: an establishment of higher education with tradition in the field (Transilvania University of Brasov), a profile well known research institute (INCDIE ICPE CA of Bucharest), and an industrial enterprise interested in the field (S.C. Electroprecizia S.A., of Sacele-Brasov). 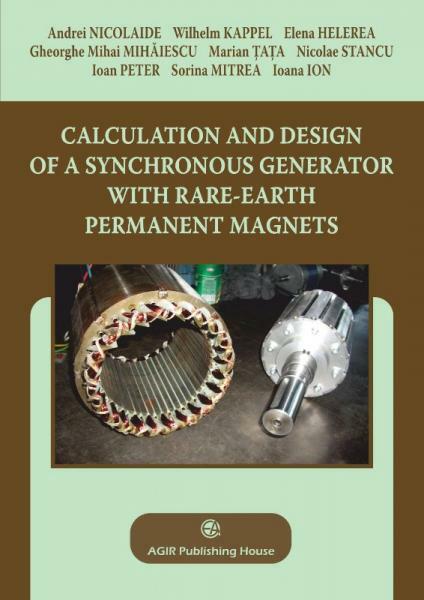 It may be worth noting that the key words of the present work are: Synchronous machines, Permanent magnets, Rare-earth NdFeB alloys. Due to the systematic and detailed treatment of the design and calculation, in the case of a concrete example, together with the achievement of the machine and experimental confirmation, the present work can be very useful for engineers, researchers and students interested in the domain of electrical machines of this type. In order to have an idea where small turbine with synchronous generator could be used, according to the known achievements, we can specify that even a small stream can be used for delivering renewable electric energy at a small price. For instance if on a site, a system turbine-generator could produce a power of 1 kW, it could supply the energy necessary for a typical house along a year. For more examples, we can add that many producers have used pumps operating in turbine regime, and denoted this set by the abbreviation PAT, what means pump working as a turbine. In this case, the turbine operates as a rotor of the centrifugal pump running in opposite sense, while the induction motor of the pump operates in generator regime. The works which have installed such systems mention their reliability for years. In the explained conditions, there follows that, in this case, the use of a synchronous generators could be advantageous relatively to the described solution with induction motor. It is worth noting that the user of the previously described PAT system requires the operation of the induction motor which drives the pump in generator regime. If a power net is accessible, the problem is not complicate, because the induction motor can be connected directly to the power net and it will operate like an asynchronous generator. In the case of an installation, having not access to a power net, as well known, the connection of one or more capacitors, for producing the reactive power is necessary. It follows that in this case, the replacing of the asynchronous (induction) generator by a synchronous one becomes advantageous. Moreover, the solution with synchronous generator with permanent magnets becomes even more favourable, the production of reactive power being implicitly solved.